We build, calibrate and simulate a stylized energy-economy model designed to evaluate the magnitude of carbon tax that would allow the French economy to reduce by a factor of four its CO2 emissions at a forty-year horizon. We estimate the substitution possibilities between fossil energy and other factors for households and firms. We build two versions of the model, the first with exogenous technical progress, and the second with an endogenization of the direction of technical progress. We show that if the energy-saving technical progress rate remains at its recent historical value, the magnitude of the carbon tax is quite unrealistic. When the direction of technical progress responds endogenously to economic incentives, CO2 emissions can be reduced by more than that allowed by the substitution possibilities, but not by a factor of four. To achieve this, an additional instrument is needed, namely a subsidy to fossil energy-saving research. The redirection of technical progress, which is a driver of energy transition, comes at a small cost in terms of the overall growth rate of the economy. This analysis uses an integrated assessment model to link emissions from offshore oil and gas platforms in the Gulf of Mexico to impacts in the continental U.S. The analysis employs emission and production data for rigs located in the Gulf of Mexico to estimate the air pollution damages for the years 2000, 2005, and 2008. For platforms in the western Gulf of Mexico, extraction yields damage due to air pollution that average between $0.31 and $0.75 per unit of oil extracted. For platforms in the central Gulf of Mexico, damage due to air pollution averages between $0.26 and $0.57 per unit of oil extracted. The distribution of marginal social costs is right-skewed; the paper finds that in 2008 115 platforms produce damages in excess of $12.80 per barrel of oil. Optimal management of the air pollution emissions from platforms in the Gulf must recognize this spatial heterogeneity in damages. This paper shows how the effect of fuel prices varies with the level of electricity demand. It analyzes the relationship between daily prices of electricity, natural gas and carbon emission allowances with a semiparametric varying smooth coefficient cointegration model. Different electricity generation technologies have distinct fuel price dependencies, which allows estimating the structure of the power plant portfolio by exploiting market prices. The semiparametric model indicates a technology switch from coal to gas at roughly 85% of maximum demand. This model is used to analyze the market impact of the nuclear moratorium by the German Government in March 2011. Futures prices of electricity, natural gas and emission allowances are used to show that the market efficiently accounts for the suspended capacity and correctly expects that several nuclear plants will not be switched on after the moratorium. Unilateral Climate Policy: Can OPEC Resolve the Leakage Problem? In the absence of a global agreement to reduce greenhouse gas emissions, individual countries have introduced national climate policies. Unilateral action involves the risk of relocating emissions to regions without climate regulations, i.e., emission leakage. A major channel for leakage are price changes in the international oil market. Previous studies on leakage have assumed competitive behavior in this market. Here, we consider alternative assumptions about OPEC's behavior in order to assess how these affect leakage and costs of unilateral climate policies. Our results based on simulations with a large-scale computable general equilibrium model of the global economy suggest that assumptions on OPEC's behavior are crucial to the impact assessment of unilateral climate policy measures. We find that leakage through the oil market may become negative when OPEC is perceived as a dominant producer, thereby reducing overall leakage drastically compared to a setting where the oil market is perceived competitive. Is There Really Granger Causality Between Energy Use and Output? 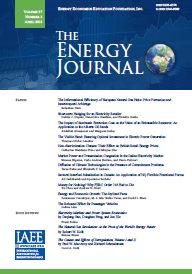 We carry out a meta-analysis of the very large literature on testing for Granger causality between energy use and economic output to determine if there is a genuine effect in this literature or whether the large number of apparently significant results is due to publication or misspecification bias. Our model extends the standard meta-regression model for detecting genuine effects in the presence of publication biases using the statistical power trace by controlling for the tendency to over-fit vector autoregression models in small samples. Granger causality tests in these over-fitted models have inflated type I errors. We cannot find a genuine causal effect in the literature as a whole. However, there is a robust genuine effect from output to energy use when energy prices are controlled for. Is Mandating "Smart Meters" Smart? The advent of "smart meters" will make possible Real Time Pricing (RTP) of electricity: customers will face and react to wholesale spot prices, thus consumption of electric power will be aligned with its opportunity cost. This article determines the marginal value of a fraction of demand (or a consumer) switching to RTP, conditional on smart meters installation. First, it establishes sufficient conditions for the marginal value of RTP to be decreasing as the fraction of customers on RTP increases. Second, it derives this marginal value for a simple yet realistic specification of demand. Finally, using data from the French power market, it estimates that, for the vast majority of residential customers whose peak demand is lower than 6 kVA, the net surplus from switching to RTP is lower than 1 €/year for low demand elasticity, 4 €/year for high demand elasticity. This finding casts a doubt on the economic value of rolling out smart meters to all residential customers, for both policy makers and power suppliers. We explore the relationships among the North American, European and Asian natural gas markets for evidence of convergence and integration for the January 1997 through May 2011 period. The analyses are conducted under a multivariate framework, so the dynamics among the prices can be captured without the necessity of identifying an anchor price series. We find evidence of convergence among the Japanese, Korean, Taiwanese and UK prices. The North American price displays behaviour that is distinct from this group of prices. We conclude that there is not a fully integrated international natural gas market. The integration between European (represented by NBP) and Asian geographic regions appears to be due primarily to underlying contractual mechanisms specifically linking natural gas prices to oil prices rather than the result of market supply and demand interactions. We also find that the relationship among the Asian markets has evolved with Japanese prices adjusting to changes in South Korean and Taiwanese prices.